(CN) – Every time it rains in Pascagoula, Mississippi, something bad happens to the water in Bayou Casotte. That’s because right next to the bayou is Mississippi Phosphates, a bankrupt fertilizer manufacturer that closed three years ago and left 7 million gallons of contaminated wastewater waiting to be flushed by rain into the bay on the Pascagoula River. But there could be help for this environmental degradation. On Dec. 8, the U.S. Environmental Protection Agency said it will step up efforts to clean up Superfund sites around the nation and has identified 21 sites for “immediate and intense” action. The Mississippi Phosphates facility is on that list. EPA administrator Scott Pruitt said the agency is putting a renewed focus on remediation of Superfund sites around the nation. That help can’t come soon enough, as the Mississippi Phosphates site is a time bomb. With 7 million gallons of contaminated water on-site, the facility creates an additional 9 million gallons of contaminated water with every inch of rain that falls on the facility. The EPA says it spends approximately $1 million a month to maintain the facility due to the high volume of wastewater generated. Since July there have been five emergency releases of wastewater totaling 270 million gallons of contaminated water into Bayou Casotte, and 40 million gallons were released in anticipation of Hurricane Nate, according to Dustin Renaud, communications director for the Gulf Restoration Network. 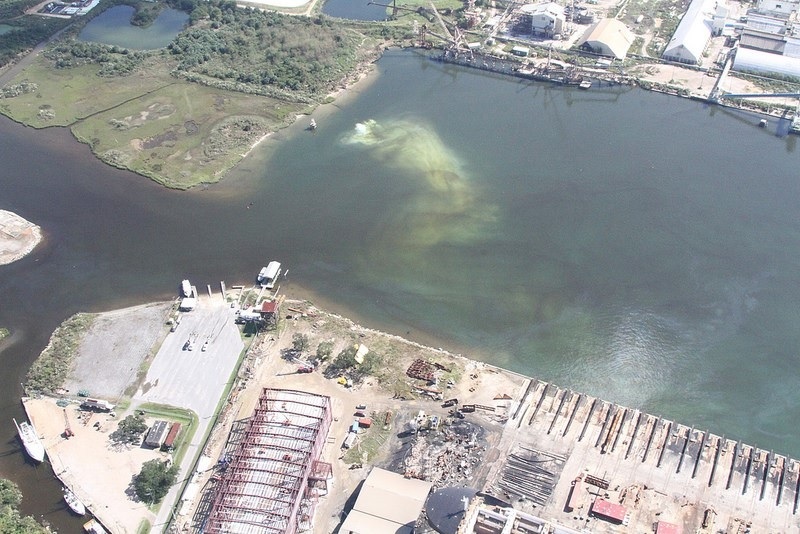 In 2015, the fertilizer company was found guilty in Mississippi federal court of discharging more than 38 million gallons of acidic wastewater in August 2013, resulting in the death of more than 47,000 fish and the closing of Bayou Casotte. The company closed in December 2014 under Chapter 11 bankruptcy protection. The EPA took over wastewater treatment at the former facility this past February, after the company’s environmental trust became insolvent. In response to a nationwide trend of environmental degradation at manufacturing plants and mills, Congress in 1982 passed the Comprehensive Environmental Response, Compensation, and Liability Act (CERCLA) and created the trust fund – later known as Superfund – that pays for cleanup. Other large Superfund sites in the United States will now get prioritized for cleanup or considered for addition to the National Priority List. After decades of inaction by the federal government over cleaning up a Superfund site in Anaconda, Montana, the community is starting to see action by the federal government, according to Bill Everett, CEO of Anaconda/Deer Lodge County. Everett is a civic leader is trying to bring businesses to the community and ensure that homes and schools are clean and safe from pollution left over from a nearby copper smelter. Owned by Atlantic Richfield, the former smelter stack still looms over the town but has been shut down for over 30 years. “We’re heading in the right direction now,” Everett said. “When I came into office last January I was really disappointed we didn’t have national representation” for Superfund site cleanup. Berkeley Pit in Butte, Montana, is a Superfund site created by decades of open-pit copper mining. The pit is slowly filling with toxic water and has become a large lake near the center of the city of Butte. Just about 30 miles west of Butte sits the Anaconda smelter where the copper ore from Butte was reduced into copper from the late 1800s and on into the 1970s. Once the hub of the industrial boom of the 1800s and 1900s, decades of ore extraction and smelting left their toll on these Montana towns, with groundwater and soils contaminated with arsenic and lead. At the Anaconda Smelter site, EPA has directed Atlantic Richfield to complete residential and commercial property sampling and cleanup of lead and arsenic on a rigorous schedule. In Anaconda, Everett said roughly 2,500 homes have been identified as possibly contaminated with lead and arsenic from the nearby smelter. He said he’s helping to formulate a plan to clean those up in 10 years. Everett said it took the response of federal bureaucracy to get the cleanup process going again. “We tried it on the community level, but we didn’t have the power necessary,” he said in a phone interview. “The focus now is on getting the community cleaned up. Butte and Anaconda sit at the headwaters of the Clark Fork River watershed, upstream from such riverside communities of Missoula, Montana. Knudsen said the EPA’s announcement may be political whitewash, but she’s glad for the efforts being made. “We appreciate the Montana delegation’s efforts to shine the spotlight on the problems,” Knudsen said. “And if Administrator Pruitt’s spotlight on these sites gets cleanup on track, we’re all about it. However, it’s hard to reconcile the talk of getting more resources to these sites, getting them remediated, and off the list when federal budget talks point to massive cuts to EPA and the Superfund program – both of which have thin resources already.